My little princess, Crystal, is very much into drawing and colouring. 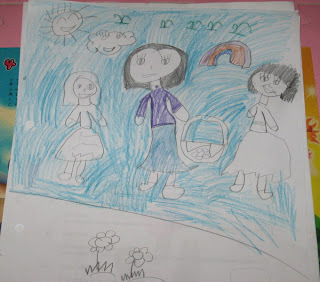 We noticed her passion in art at the age of two plus. 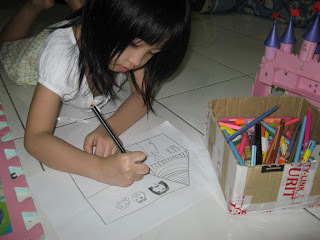 She loves drawing so much that she could just drop her school bag immediately reaching home, grab some papers and her box of colour pencils, quietly and freely unleashing her creativity on papers (still with her socks on most of the times). We encourage her by providing her crayons and various types of colour pencils, draft papers and colouring books and most importantly our compliments for her lovely drawings. We believe by exposing her to art would stimulate her brain, which lays the foundations for her future learning ability. Researchers find that children as young as six months are believed to benefit from artistic stimulation. Pearl, at the age of slightly over two is following her sister closely. 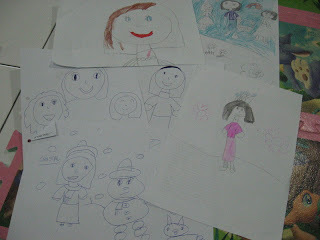 She started to scribble at first and now she is able to draw as well, her favourite drawings are faces, sun and balloons. 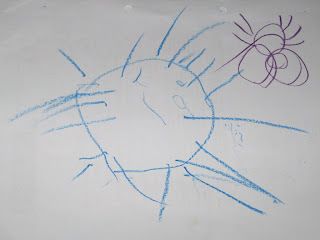 This one is from Pearl, it a sun, sun..
We make sure that the type of crayons and colour pencils that the girls used are non- toxic. The most commonly used ones are from Staedtler and Faber Castell. The daddy once introduced them to water colour painting, it was so messy and requires a lot of supervisions as Pearl is too little to handle it. We have to put that on hold for now..
She would make a great artist one day! hope so..thanks for dropping by! !